SMS gateway number is a number that you use to either send SMS from your mobile phone or that your friends can use to send SMS to you from their mobile phones. 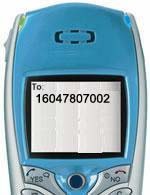 You can also use these numbers to send email messages from your SMS phone. Send your SMS messages to one of these numbers and they will be processed by our service. If you require a dedicated virtual SMS number, please contact us with your requirements.